For Aaron Williams, who is four years out of college, it was not surprising to hear that our analysis showed 54 of the 113 programs don’t offer a standalone class on data journalism. Williams has worked in data journalism at the Los Angeles Times, the Center for Investigative Reporting, and now as interactive editor at the San Francisco Chronicle. Almost everything he knows he learned from colleagues at NICAR, he said. “I didn’t even really know about data journalism as a discipline, nor did my instructors … until basically I was a senior,” Williams recalled. 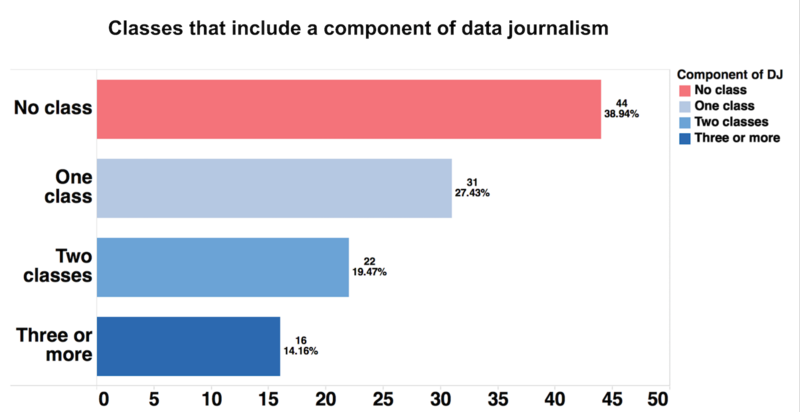 Of the 59 programs we identified that teach at least one data journalism class, 27 of the schools offer just one course, usually foundational. Fourteen offer two classes. Just 18 of the 59 schools teaching data journalism offer three or more classes in this subject. At a minimum, these programs offer courses that teach students to use spreadsheets to analyze data for journalistic purposes. At the other end of the spectrum, some schools provide far more, teaching multiple classes in programming skills, such as scraping the Web, building news apps, or creating advanced data visualizations. But programs with multiple classes are rare. A significant number of programs offer some instruction in data journalism, even if they don’t provide a standalone class. Of the 113 ACEJMC-accredited programs, 69 integrate some data journalism into other reporting and writing courses, our analysis showed. In most cases, this entails introducing the concepts of using spreadsheets or basic analysis as part of reporting and writing classes or certain topic classes, such as business journalism. Again, tables summarizing these findings can be found in the appendix, while the remainder of this chapter will dig deeper into our analysis of syllabi and course offerings in data journalism.